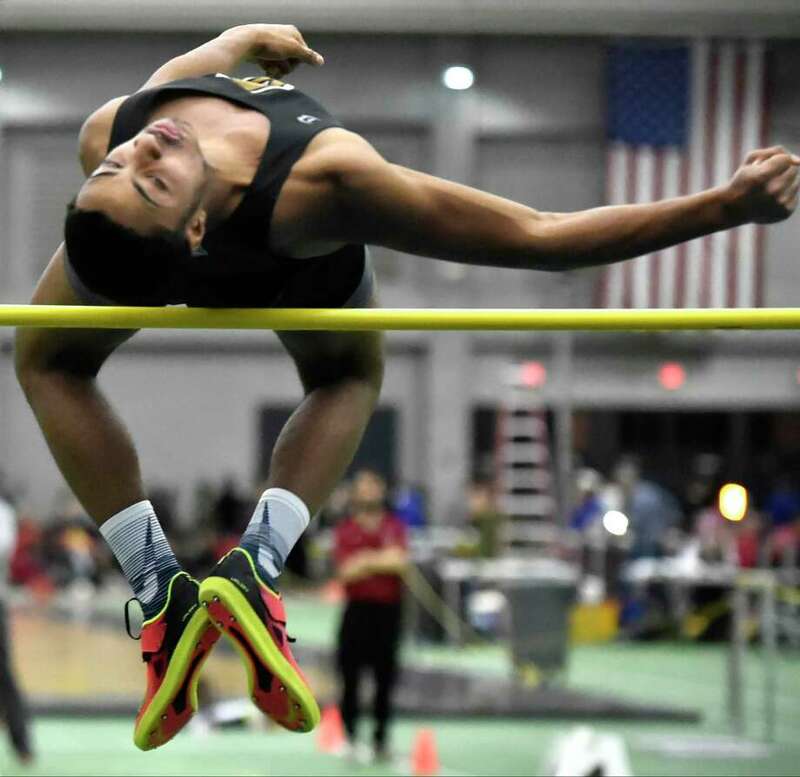 Amity’s Shaun Graham wins the high jump during the Class L indoor track championship Friday in New Haven. NEW HAVEN — Xavier boys indoor track coach Chris Stonier, who only has nine athletes on the team, crunched the numbers before the CIAC Class L track and field meet and figured his team had a shot to win a class title for the first time since 1999. William Curran and Robbie Cozean led the Falcons to individual wins, the team won the sprint medley relay and the Falcons went on to win the Class L boys meet with 64 points. Amity was second with 43 points and East Lyme was third with 40.5. “We had nine athletes and they all scored points for us,” Stonier said. “It’s incredible. We ran personal bests in almost every event that we finished. Windsor won the girls meet with 69 points, Darien was second with 49 and East Lyme was third with 38. In addition to Xavier, the Wilbur Cross girls had their share of success, Richard Papa of Amity enjoyed a pair of wins and Shelby Dejana of Wilton couldn’t have been happier with her winning time in the 55 hurdles. In the boys meet, Curran and Cozean led Xavier. Curran had a win in the 1000 (2 minutes, 37.51 seconds) and teammate Peter Schulten was second in 2:39.57. They stayed behind the leader and surged ahead with two laps to go as Curran took the lead and Schulten second and pulling away. Cozean chipped in for the Falcons with a win in the 3200 (9:26.18) and third place in the 1600 (4:32.114). Papa started his day by running a leg of the boys 4×200 relay that Amity won in 1:35.86. Paul Johnson, Joe Dibenedetto and Ariel Gordon also ran the relay. Papa followed up the relay win with a win in the 55 hurdles in a school record 7.69. In the girls competition, the 300 was turning point for Windsor, which swept the top four spots, led by Cori Richardson who won in 41.87. “The 300 has been a big event for us the last four years,” Windsor coach Kelvan Kearse said. “Getting those top four finishes gave us a lot of points, too many for other teams to make up. Today it was really a team effort. Our 4×200 and 4×400 relays ran well. Grace Adolphe won the girls 1000 and Susie Okoli won the shot put to lead the Wilbur Cross girls team. Adolphe took the lead going around the first turn and pulled away to win in 3:01.92. “I really wanted to break 3 minutes today, but I’ll take 3:01, I’m happy to get the win,” Adolphe said. “I’ll focus on that goal the next race at the State Open. Okoli won the shot put with a distance of 38 feet, 11.25 inches. Erica Marriott of North Haven won the long jump with 16 feet, 4 inches and Abigail Williams of Bunnell was second with 16-0. Meredith Bloss won the 3200 (11:25.92) and Claire Daniels of New Milford won the 1600 (5:13.28). 55 Meter Dash Finals: 1. Messiah Harling, Wilby, 6.59; 2. Christ N’Dabian, Bunnell, 6.63; 3. Edward Williams, Middletown, 6.70; 4. Nathan Burnett, Windsor, 6.71; 5. Gabriel Bryan, Windsor, 6.73; 6. Ameen Parks, Daniel Hand, J6.73. 300 Meter Dash: 1. Tyler Cady, Fitch, 35.98; 2. Warren Murphy, Notre Dame-West Haven, 36.02; 3. Ameen Parks, Daniel Hand, 36.39; 4. Jack Holly, Darien, 36.78; 5. Jack Myers, Wilton, 37.07; 6. Paul Johnson, Amity, 37.17. 600 Meter Run: 1. Jose Ramirez, Bristol Central, 1:24.76; 2. Nathan Metsack, E.O. Smith, 1:24.95; 3. Elijah Lewis, Crosby, 1:25.94; 4. Cory Bill, E.O. Smith, 1:26.01; 5. Marquis Whyte, New London, 1:26.39; 6. Max Shafer, Cheshire, 1:28.63. 1000 Meter Run: 1. William Curran, Xavier, 2:37.51; 2. Peter Schulten, Xavier, 2:39.57; 3. Connor Visnic, Amity, 2:40.26; 4. Christopher Abbey, East Lyme, 2:41.22; 5. Ryan Grochowski, Xavier, 2:43.75; 6. Austin Freve, Bristol Central, 2:43.85. 1600 Meter Run: 1. Samuel Whittaker, East Lyme, 4:23.00; 2. Matthew Lecky, Middletown, 4:24.28; 3. Robbie Cozean, Xavier, 4:32.14; 4. Peter Schulten, Xavier, 4:37.43; 5. Eamon Burke, Xavier, 4:39.68; 6. Dante Zucconi, Daniel Hand, 4:40.95. 3200 Meter Run: 1. Robbie Cozean, Xavier, 9:26.18; 2. Eli Nahom, New Milford, 9:27.23; 3. Connor Visnic, Amity, 9:40.30; 4. Samuel Whittaker, East Lyme, 9:42.67; 5. Dillon Selfors, Xavier, 9:44.82; 6. Mark Petrosky, Bristol Central, 9:48.02. 55 Meter Hurdles: 1. Richard Papa, Amity, 7.69; 2. Robert Farley jr., North Haven, 8.06; 3. Jason Sawicki, Notre Dame-West Haven, 8.29; 4. Charlie Golbourn, Wilton, 8.30; 5. Zachary Koslosky, Naugatuck, 8.32; 6. Greyson McGeary, Daniel Hand, 8.37. 4×200 Meter Relay: 1. Amity (Paul Johnson, Ariel Gordon, Joseph Dibenedetto, Richard Papa), 1:35.86; 2. Notre Dame-West Haven (Warren Murphy, Kevin Joyner, Casey Tonelli, Christian Panagrossi), 1:36.28; 3. Kennedy (Tyreke Scarlett, William Mahoney, Taj Thomas, Tariq Phillips), 1:36.32; 4. Simsbury (Dylan Wehrly, Miguel Gutierrez, Jack Broda, Taehyeon Park), 1:37.14; 5. Pomperaug (Max Bueno, Mark Cristino, Ryan Karp, Aidan Markward), 1:37.60; 6. Wilby (Dylen McKitty, Messiah Harling, Daniel Navarro, Leonardo DaGraca), 1:37.69. 4×400 Meter Relay: 1. Darien (Pierce Hoyda, Andrew Donovan, Austin Dehmel, Jack Holly), 3:34.79; 2. Notre Dame-West Haven (Dan Range, Neel Agir, Christian Panagrossi, Warren Murphy), 3:34.97; 3. Windsor (Cordell Holliday, Le-Andre Gayle, Nathan Burnett, Brenden Wolliston), 3:35.57; 4. New Milford (Jonathan Tarbet, Jesse Meadows, Andre Vial, Luke Chastain), 3:35.59; 5. Daniel Hand (Connor Parthasarthy, Corey Duncanson, Greyson McGeary, Carson Hines), 3:37.88; 6. Kennedy (Tyreke Scarlett, Taj Thomas, William Mahoney, Tariq Phillips), 3:38.02. 4×800 Meter Relay: 1. East Lyme (Samuel Whittaker, Matthew Kung, Robert Avena, Fred Rukundo), 8:16.87; 2. Bristol Central (Pacifico Flores, Mark Petrosky, Devin Flores, Jose Ramirez), 8:18.22; 3. Xavier (Dillon Selfors, Ryan Grochowski, George Luke, Pierre Sylvain), 8:19.00; 4. Simsbury (Ian Wehrly, Luke Lammey, Owen Wollenberg, Sean Vargas-Altamirano), 8:31.47; 5. New Canaan (Alessandro Malagoli, Ajamo Carraby-Jones, Andrew Malling, Ryan Lytle), 8:36.20; 6. Wilton (Flynn Crowther, Davis Cote, Nicholas Ivanov, Tyler Zengo), 8:39.38. 1600 Sprint Medley: 1. Xavier (Christian Schaefer, James Dickman, Pierre Sylvain, William Curran), 3:40.86; 2. Simsbury (Dylan Wehrly, Miguel Gutierrez, Jack Broda, Owen Wollenberg), 3:44.12; 3. Daniel Hand (Braeden Kosiewicz, Joshua Stewart, Carson Hines, Connor Parthasarthy), 3:46.24; 4. New Milford (Nolan Freeman, Andre Vial, Luke Chastain, Jason Golembeski), 3:46.61; 5. East Lyme (Jonathan Zavaleta, Blane Hart, Robert Avena, Christopher Abbey), 3:47.23; 6. E.O. Smith (Kobe Stigler, Nathan Metsack, Cory Bill, Keegan Santasiere), 3:47.96. High Jump: 1. Shaun Graham, Amity, 6-02; 2. Ryan Eppley, Darien, 6-00; 2. Jason Sawicki, Notre Dame-West Haven, 6-00; 4. Russell Powell, Daniel Hand, 5-10; 5. John Peiser, New Canaan, J5-10; 6. Makaih Olawale, East Lyme, 5-08; 6. Caleb Nugent, Daniel Hand, 5-08. Pole Vault: 1. Akhil Chiamkurthi, East Lyme, 13-00; 2. Zachary Koslosky, Naugatuck, 12-06; 3. Kiernan Daly, Darien, J12-06; 4. Eric Spignesi, North Haven, 12-00; 5. Bryce Myers, Daniel Hand, J12-00; 6. Max Bothwell, Notre Dame-West Haven, 11-06. Long Jump: 1. Messiah Harling, Wilby, 21-01.25; 2. Le-Andre Gayle, Windsor, 20-05.75; 3. Hunter Peterson, Bristol Central, 20-05; 4. Kobe Stigler, E.O. Smith, 20-02; 5. Thoby Wooder, Wilton, 20-01; 6. Benjamin Healy, Naugatuck, 19-10.75. Shot Put: 1. Michael Browning, Rham, 59-00.75; 2. Jonathan Prell, Simsbury, 55-09; 3. Jack Conley, New Canaan, 50-04.25; 4. Davon Colon, Xavier, 48-04.25; 5. Kyle Maruca, North Haven, 47-04.50; 6. Nicholas Helbig, Fitch, 46-01. 55 Meter Dash Finals: 1. Cori Richardson, Windsor, 7.23; 2. Elizabeth St George, New Canaan, 7.41; 3. Bridget Lalonde, Rham, 7.44; 4. Shelby Dejana, Wilton, 7.57; 5. Kesiri Gonzales, Bunnell, 7.58; 6. Claudia Nanez, Wilton, 7.59. 300 Meter Dash: 1. Cori Richardson, Windsor, 41.87; 2. Jalah Cooper, Windsor, 42.11; 3. Zarieh Coleman, Windsor, 42.65; 4. Cyana Lindsay, Windsor, 43.32; 5. Claudia Nanez, Wilton, 43.48; 6. Tyler Towers, New Canaan, 44.25. 600 Meter Run: 1. Elsa Martin, Simsbury, 1:37.66; 2. Kate Johnson, Pomperaug, 1:43.45; 3. Grace Strauch, Windsor, 1:43.97; 4. Ellie McCoy, East Lyme, 1:45.49; 5. Ivy Gelhaus, Woodstock Academy, 1:46.13; 6. Kathryn Menard, Mercy, 1:46.34. 1000 Meter Run: 1. Grace Aldophe, Wilbur Cross, 3:01.92; 2. Edith Walker, Rham, 3:05.58; 3. Sidney Palinkas, Simsbury, 3:07.60; 4. Chloe Thompson, Daniel Hand, 3:10.76; 5. Sophie Curcio, New Canaan, 3:13.17; 6. Allison Murphy, Naugatuck, 3:15.26. 1600 Meter Run: 1. Claire Daniels, New Milford, 5:13.28; 2. Mairead Clas, Darien, 5:14.36; 3. Elizabeth Bigelow, E.O. Smith, 5:23.21; 4. Molly Murphy, New Canaan, 5:27.62; 5. Elaina Tiller, New Canaan, 5:28.65; 6. Gianna Siciliano, Guilford, 5:30.65. 3200 Meter Run: 1. Meredith Bloss, Guilford, 11:25.92; 2. Rhiannon Richmond, Avon, 11:33.49; 3. Brooke Morabito, New Milford, 11:37.79; 4. Miranda Graves, E.O. Smith, 11:47.41; 5. Katrina Wiegmann, Farmington, 11:50.67; 6. Elaina Tiller, New Canaan, 12:08.45. 55 Meter Hurdles: 1. Shelby Dejana, Wilton, 8.61; 2. Isabella Azar-brandes, Pomperaug, 8.81; 3. Madison Webster, Mercy, 9.07; 4. Kylie Neretich, Naugatuck, 9.25; 5. Mary Sirois, Mercy, 9.36; 6. Analy Alabre, Windsor, 9.38. 4×200 Meter Relay: 1. Windsor (Cori Richardson, Cyana Lindsay, Zarieh Coleman, Jade Robinson), 1:46.99; 2. Rham (Katie Kingsley, Madison Czarnecki, Morgan Czarnecki, Bridget Lalonde), 1:47.50; 3. Pomperaug (Isabella Azar-brandes, Olivia Farina, Kate Johnson, Samantha Kipperman), 1:51.52; 4. Masuk (Julianna Lindquist, Madison Samperi, Gretchen Bunovsky, Rachel Colegrove), 1:51.80; 5. Bunnell (Dardielle Exantus, Kaylah Phommachanh, Kesiri Gonzales, Abigail Williams), 1:52.05; 6. East Lyme (Darya Mikusova, Nancy Alden, Margaret Dunne, Katherine Harris), 1:52.30. 4×400 Meter Relay: 1. Darien (Alexis Lyons, Suzanna Alliegro, Charlotte Sulger, Sally Boucher), 4:12.22; 2. East Lyme (Saige Deveau, Sophie Taylor, Katherine Harris, Julia Bates), 4:12.85; 3. Windsor (Zarieh Coleman, Jalah Cooper, Analy Alabre, Grace Strauch), 4:14.75; 4. Masuk (Madison Kobza, Amanda Campos, Rachel Colegrove, Julianna Lindquist), 4:24.09; 5. New Canaan (Celia Sokolowski, Riley Shipman, Ella Gibb, Tyler Towers), 4:25.33; 6. Fitch (Ava Paprocki, Riley Marquis, Janaya Burley, Paige Pollard), 4:25.71. 4×800 Meter Relay: 1. East Lyme (Gillian Goodwin, Laura Agbayani, Sophie Taylor, Julia Bates), 9:52.77; 2. Darien (Charlotte Sulger, Cameron Appleby, Daphne Cutler, Mairead Clas), 9:53.65; 3. New Milford (Shannon Palmer, Cassidy Ranno, Claire Daniels, Brooke Morabito), 9:54.94; 4. New Canaan (Molly Murphy, Ella Gibb, Abby Cheney, Sophie Curcio), 10:14.55; 5. E.O. Smith (Sarah Cao, Jayden Stygar, Bridget Olson, Analiese Hardon), 10:33.77; 6. Wilbur Cross (Margo Pederson, Sally Inahuazo, Stephanie Meza Sanchez, Mary Ruiz), 10:38.34. 1600 Sprint Medley: 1. East Lyme (Saige Deveau, Nancy Alden, Katherine Harris, Julia Bates), 4:23.56; 2. Darien (Alexis Lyons, Charlotte Van Ingen, Suzanna Alliegro, Daphne Cutler), 4:29.09; 3. Windsor (Khaia Moye, Jade Robinson, Grace Strauch, Olivia Gregory), 4:29.20; 4. Simsbury (Julia Hahne, Molly Singer, Sidney Palinkas, Emma Martin), 4:29.52; 5. Wilbur Cross (Yaleija Jackson, Sadeja Angus, Nyla Conaway, Grace Aldophe), 4:33.85; 6. Pomperaug (Brianna Stuart, Priya Abraham, Lilyann Steenburgh, Charlotte Brehmer), 4:39.07. High Jump: 1. Grace Stephens, Masuk, 5-00; 2. Chelsi Chevannes, Darien, J5-00; 3. Nyla Conaway, Wilbur Cross, 4-10; 3. Julia Theriaque, Woodstock Academy, 4-10; 3. Sofia Migani, Guilford, 4-10; 6. Anne Bekasi, Maloney, J4-10; 6. Zaria Williams, Hartford Public, J4-10. Pole Vault: 1. Haley Jaquith, E.O. Smith, 10-00; 2. Anna Rava, Wilton, 8-06; 2. Amanda Pedro, Rham, 8-06; 4. Lynn Delillo, East Lyme, 8-00; 5. Valerie Blais, E.O. Smith, J8-00; 6. Ashley Hagander, Darien, 7-06. Long Jump: 1. Erica Marriott, North Haven, 16-04; 2. Abigail Williams, Bunnell, 16-00; 3. Chelsi Chevannes, Darien, 15-09.75; 4. Zaria Williams, Hartford Public, J15-09.75; 5. Rachel Cleveland, Windsor, 15-06.25; 6. Kaylah Phommachanh, Bunnell, 15-00.50. Shot Put: 1. Susie Okoli, Wilbur Cross, 38-11.25; 2. Clarissa Nock, Wethersfield, 38-04; 3. Wenesha Stewart, Hartford Public, 38-00.25; 4. J’Onelle Davis, Fitch, 32-10.75; 5. Armani Sidik, Hartford Public, 32-10.25; 6. Sydney Buckley, East Lyme, 32-08.25.